If you’ve never had cold brew coffee, you’re missing out. Way smoother than anything brewed hot (due to lower acidity), this stuff goes down like a dream. Free of bitterness, almost sweet, this method of brewing coffee allows all those wonderfully delicious sounding flavor notes of your coffee to shine. Now you’ll actually taste that chocolate and caramel. Be warned though, this is highly caffeinated (enough to have ruined my so called caffeine tolerance… and given me the shakes all day), so drink carefully. Grind coffee beans to a coarse grind. Measure out 8 heaping tablespoons coffee grinds into the bottom of the French press. Pour in 4 cups water. Place lid on top of French press (with pour spout closed), do not press down plunger. Leave on counter to steep for 12-24 hours (I get everything going before I go to bed, and let it steep overnight). When desired amount of time has elapsed, turn top of French press to open pour spout. Press plunger down gently, but firmly with the palm of your hand (Don’t be afraid to go slow, more coffee grinds will stay trapped behind the screen. Be patient. )… Until it is all the way down. 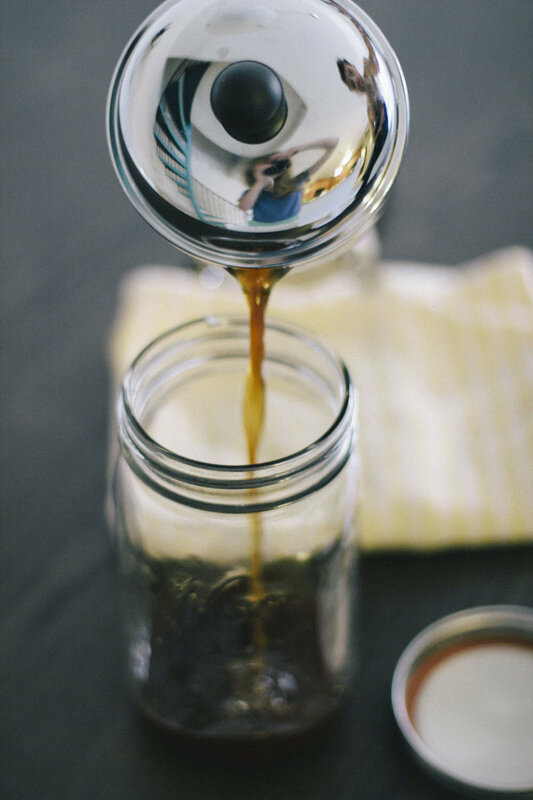 Pour half of the coffee concentrate into each mason jar, and dilute each jar with half of the water (dilute according to how strong you like it). Close lids tightly, shake gently to mix, and store in fridge until ready to serve. Place ice in cups (smaller mason jars for more style points), and pour cold brew over ice to serve. Stir any desired add-ins into cups. Enjoy!